The days of Arsenal being one of English football’s elite clubs are over but bookmakers have yet to grasp the fact that the Gunners do not have sufficiently deep pockets to compete with Chelsea, Manchester City and Manchester United. Arsenal has won two three English Premier League crowns, four English FA Cup championships and four FA Community Shield titles under its longest serving and most successful boss, Arsene Wenger, but not even the Frenchman can continue to make a silk purse out of a sow’s ear for the Gunners. When the English Premier League kicked off amid much fanfare in 1992, there was a Big Five in English football – Arsenal, Everton, Liverpool, Manchester United and Tottenham. And the Gunners maintained their place at the top table throughout the 1990s and 2000s. But now there is, at most, three big clubs and Arsenal is not one of them, with its chairman, Peter Hill-Wood, admitting that the Emirates Stadium side cannot match the spending power of its major rivals. The Gunners have not won a significant trophy since beating Manchester United on penalties in the 2005 English FA Cup final and pressure is mounting on Wenger, who has steered them to the UEFA Champions League in each of his 15 full seasons in charge. A growing number of punters are backing Arsenal and Wenger to go their separate ways before the end of this term but the odds of that happening are much longer than the odds that are available from bookmakers currently. Wenger is as short as 7-4 to not be in charge of the Gunners for the final round of this season’s English Premier League and 4-1 to be the next English top-flight manager to leave his post. 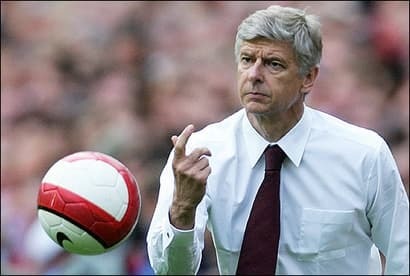 Frankly, those odds are nothing short of stupid because the Frenchman has a contract until June 2014 and Arsenal’s board has shown no sign of asking him to go. But it does make sense to oppose the Gunners on some exotic markets, most notably the ones pertaining to their English Premier League points tally and finishing position. Indeed, both of them throw up excellent bets in terms of value. Arsenal has won 24 points from its first 16 English Premier League games this term. According to the basic ladder, the Gunners are only two points behind fourth-placed Everton, which is probably why most bookmakers are offering around evens that they finish in the top four. However, the basic ladder does not tell the full story. One has to look at a ladder that compares this season’s results with those of last term’s corresponding fixtures to get a better reading of how Arsenal is travelling as Christmas races into view. To put it simply, the Gunners are a whopping 12 points off the pace that they set last season and, therefore, they are on track to finish in fifth position on 58 points, 10 fewer than Tottenham in fourth spot. Those projections suggest that bookmakers are overrating Arsenal substantially. One can back the Gunners not to make the English Premier League top four at odds of around 5-6 and, also, one can snap up odds of around 9-10 about Arsenal accruing fewer than 65 points. Both bets constitute great investments. Markets are available on Paddy Power.